This surgery has evolved in the last 20 years. 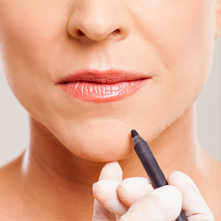 Chin surgery was done mainly as an Orthognatic procedure, in which the boney chin button was moved forward. It was a hospital procedure and involved significant down-time and quite costly. Over the years this surgery has changed to be mainly an implant type of surgery. At first silastic implants were used, now however I almost solely use Medpor Implants. Medpor Polyethylene implants have a long history of successful use in trauma repair. I almost exclusively use a contoured two piece chin implant which is designed with a gradual taper to provide excellent bony anatomy. They can be designed for both anterior and inferior projections. In addition the tapered wings provide augmentation to address unwanted jowl lines. These implants are placed below the periostium from an incision intra orally; and fixated with a couple of titanium screws. The implant can be trimmed and modified at the time of surgery. There are many different types of Medpor implants that can be used to augment the cheek and mandible.